The Jubilee government turned down Raila Odingaâ€™s request for additional security, Kenya Today can now reveal. Raila had requested at least 20 police officers as reported in this Star article of May 2013. 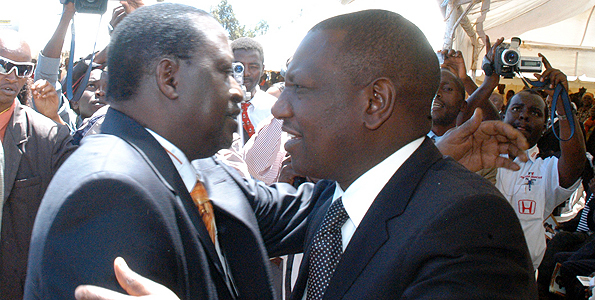 Deputy President William Ruto communicated the decision to the former Prime Minister last week when the two met privately at Rutoâ€™s Karen house. During the meeting, Raila reportedly reminded Ruto that Jubilee had promised that it would increase his personal security along with former Vice President Kalonzo Musyoka. Raila and Kalonzo were assigned close to 100 police officers during the last government but they were withdrawn, along with their government vehicles, shortly after President Uhuru Kenyatta was sworn in on April 9. A few police officers continued guarding them but without clear guidelines. Raila and Kalonzo met Uhuru and Ruto at State House on April 13 to express concern over their security and government promised to issue a directive. Head of Public Service Francis Kimemia was expected to issue guidelines on how many men and resources their security details would have. However there has been no communication from the government since then. According to sources, this prompted Raila to meet Ruto again to request an enhanced security detail of up to 20 police officers working in shifts. Ruto, according to insiders, said 20 officers was too high but said that Jubilee government would honor the VIP status of Raila and Kalonzo with no further elaboration. There is no law clearly providing for how a former PM and VP should be treated. Both Raila and Kalonzo missed out when President Kibaki rejected the Retirement Benefits (Deputy President and Designated State Officers) Bill 2013 in January. Kibaki rejected the Bill because of the huge retirement packages that MPs had awarded themselves just before the end of the last Parliament. Retired Presidents Daniel Moi and Mwai Kibaki are both well catered for under the Presidential Retirements Benefits Act. The Act gives a retired president 12 security officers- six for his own personal security and six others to guard his Nairobi and rural homes. In the April meeting with Uhuru and Ruto, it was suggested that the two Cord leaders be each accorded 12 police officers like Moi and Kibaki. Insiders within Jubilee said that Raila and Kalonzo would first have to quit active politics before they can enjoy such benefits. â€œEven before the enactment of a law, this can easily be done through a circular by the head of public service. But what we know is that such retirement benefits cannot be extended Â to Â a person one who is still active in politics,â€ said a source at the Office of the President yesterday. The Presidential Retirements Benefits Act provides that that a former president will lose all his benefits if he engages in active politics. The bill rejected by Kibaki provided that â€œan entitled person shall not hold office in any political party at any time.â€ Raila and Kalonzo have indicated that they will continue leading the opposition from outside Parliament.Â Raila is still the ODM leader while Kalonzo continue to serve as the leader of Wiper Party. The Bill had also provided that a person entitled to retirement benefits â€œmay be requested by the Government to perform specific official functions and shall be paid a reasonable allowance in respect of such official functions.â€ On Sunday, Raila stated that he is not ready to take up any job assigned to him by President Uhuru.